Asus ROG has released a pair of gamer / enthustiast / overclocker friendly high end desktop motherboards that are built to make the most of the Intel Core-X series of processors (up to 18 cores / 36 threads). 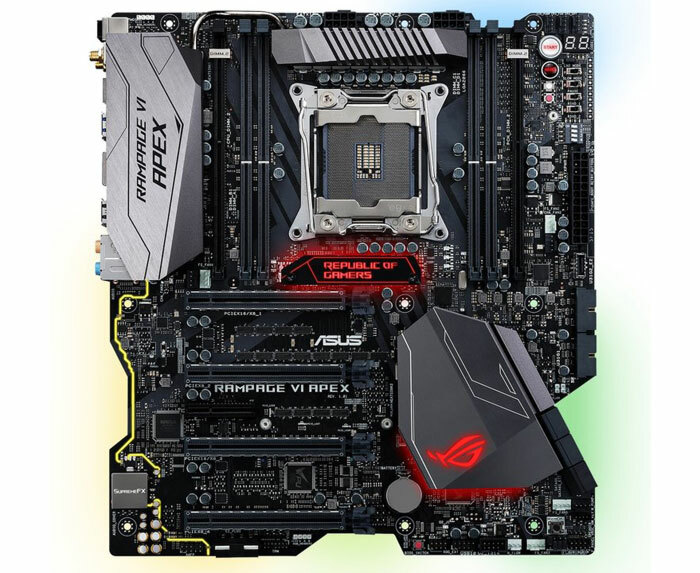 The Asus ROG Rampage VI Extreme and Apex boards are based upon Intel's X299 chipset and are both E-ATX in size, offer Quad-channel DDR4 (OC) support, and have Aura Sync RGB LED lighting. The Asus ROG Rampage VI Extreme is aimed most squarely at gamers who wish to deploy custom liquid cooling setups. Asus has equipped all of the usual fan and pump headers, plus a flow header that lets you monitor the coolant coursing through your loop. A further connector facilitates the provision of flow, temperature, and leakage data with water blocks designed for the Extreme. Motherboard highlights are listed below, and the full specs can be found here. Here is a motherboard with an 'X' shaped PCB, designed for top performance and the highest possible overclocks. The Asus ROG Rampage VI Apex has already been leveraged by OC champs and achieved "seven world records and 16 global first places," says Asus. For example, this motherboard was key to achieving the highest CPU frequency for an Intel Core i7 processor, with 7.562GHz on all four cores and eight threads. Further motherboard highlights are listed below, but you can check out the full spec here. Intel Core X Series processor family: Ready for the latest LGA 2066 socket CPUs. Made for great gaming: 5-Way Optimization, SupremeFX audio, Intel gigabit Ethernet and LANGuard. 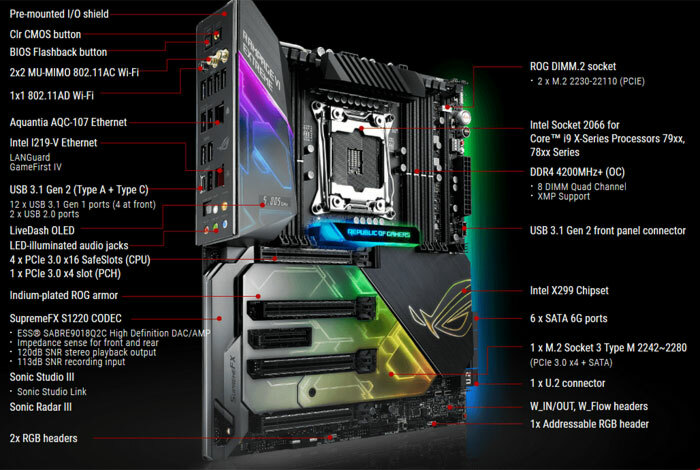 Asus says that the ROG Rampage VI Extreme and ROG Rampage VI Apex motherboards are available now, or very soon, at leading resellers. The respective RRPs are £579.99 for the Asus ROG Rampage VI Extreme, and £429.99 for the Apex. It appears that this motherboard is suffering from an advanced stage of GBD - gaming branding disease. Common early symptoms of GBD in motherboards typically include dark colour schemes, audio system hype and gratuitous use of decals and PCB silk screening. More developed cases of motherboard GBD may involve RGB lighting, excessive heat sink shrouding, an excess of I/O and high RRP. In this instance, arbitrary angle syndrome (AAS), which is common among chassis' affected by GBD, is apparent not only on the excessive heat sink shrouding, but may also be responsible for the missing sections of motherboard - indicating a hitherto undocumented stage of GBD in motherboards. It is this authors opinion that the rampant and seemingly unstoppable spread of GBD in motherboards, and indeed across other computer components, is aesthetically offensive, represents poor value for money and is kinda dumb. Did someone drop it or something. A nasty looking expensive pair of boards!